Dr. Tim Groseclose, a professor of political science and economics at UCLA, has spent years constructing precise, quantitative measures of the slant of media outlets. He does this by measuring the political content of news, as a way to measure the PQ, or "political quotient" of voters and politicians. Among his conclusions are: (i) all mainstream media outlets have a liberal bias; and (ii) while some supposedly conservative outlets—such the Washington Times or Fox News' Special Report—do lean right, their conservative bias is less than the liberal bias of most mainstream outlets. 1. What Are PQs and How Do They Reveal Media Bias? "COME ON. POLITICAL science isn't really a science," said my friend Dawson Engler one day, trying to goad me. “I'm no conservative, but I loved Left Turn. Tim Groseclose has written the best kind of book: one that is firmly anchored in rigorous academic research, but is still so much fun to read that it is hard to put down. Liberals will not like the conclusions of this book, which in my opinion, is all the more reason why they should want to read it.” —Steven Levitt, Professor of Economics, University of Chicago, and co-author of Freakonomics. “This book--an evolution from the pioneering article in the 2005 Quarterly Journal of Economics by Groseclose and Jeffrey Milyo--uses a clever statistical technique to construct an objective measure of conservative or liberal bias in news coverage. This method and those now adopted by other serious researchers show clearly that most U.S. news outlets lean left. Most frighteningly, we learn that the media bias actually affects the ways that people think and vote.” —Robert Barro, Professor of Economics, Harvard University, and Senior Fellow, Hoover Institution. 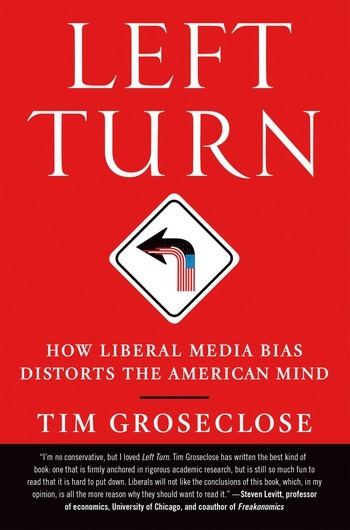 “This book serves up the most convincing evidence for media bias I have seen, ever. Tim Groseclose is the leading academic scholar in the area, but this is a smartly-written book which every person can read for enlightenment and also for pleasure.” —Tyler Cowen, Professor of Economics, George Mason University, and co-author of the internationally acclaimed economics blog, MarginalRevolution.com.